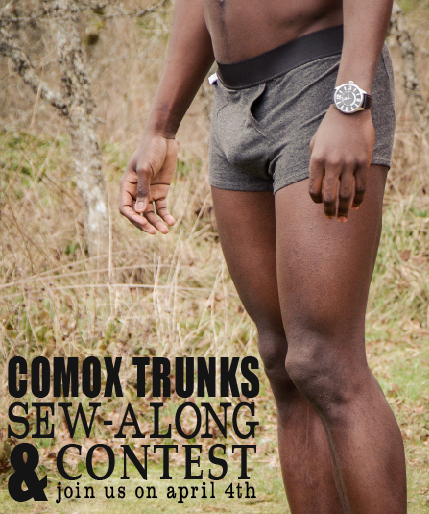 Welcome to the first day of our Comox Trunks Sew-Along! 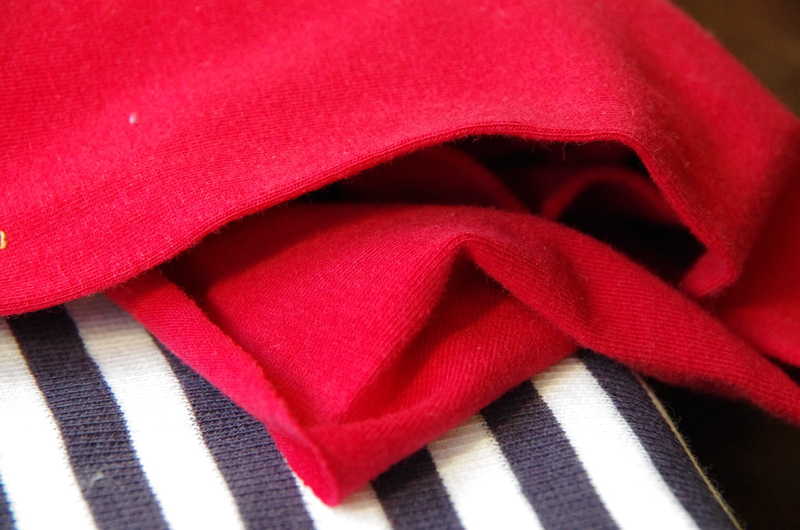 Today I will be giving you some tips and a photo guide to choosing your fabric and elastic. 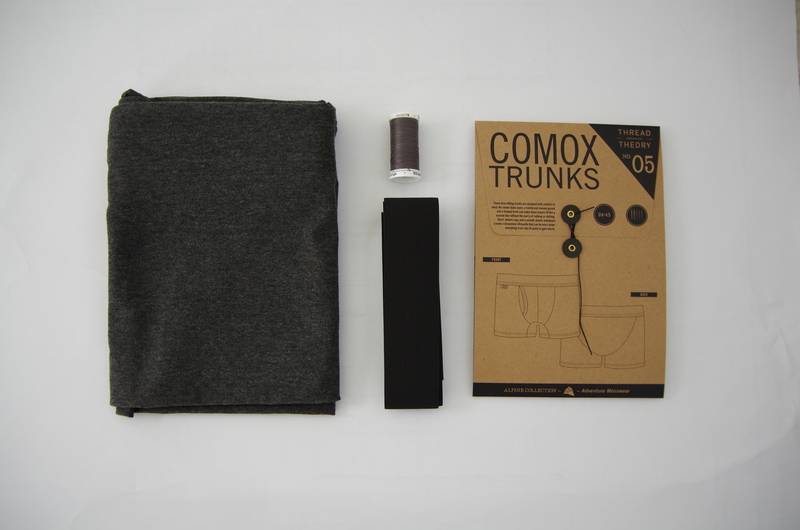 Here are the supplies I have gathered together to sew up some Comox Trunks: As you can see, the fabric I have chosen is a lightweight charcoal coloured knit. It is comprised of bamboo and cotton with a touch of spandex. It is available as part of our Comox Trunks Supplies Kit along with the black elastic. If your local haberdashery only has a small selection of knit fabrics, don't worry, you still likely be able to find something that will work for your Comox Trunks. The Comox Trunks will end up fitting best throughout a long day of wear if you pick a fabric with at least a small amount of spandex content. The spandex adds resiliency to the fabric to help prevent your trunks from growing baggier and saggier throughout the day. 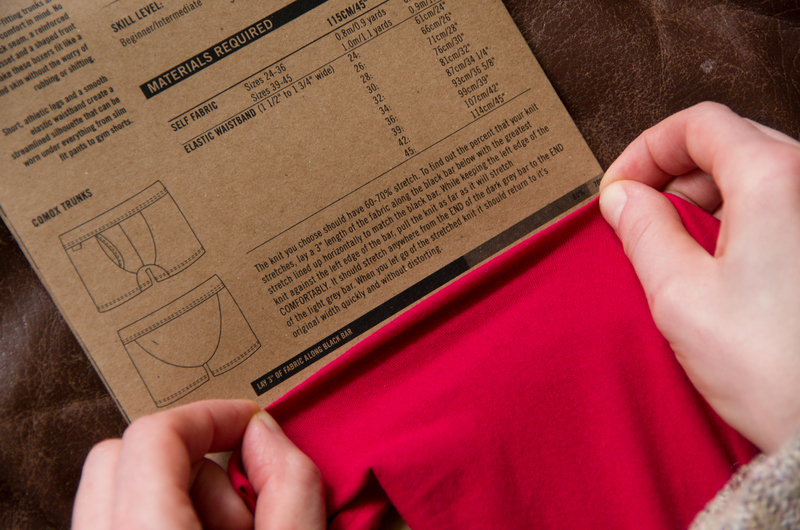 Here is a close up examination of the bamboo/cotton jersey that we include in our Comox Trunk kits. 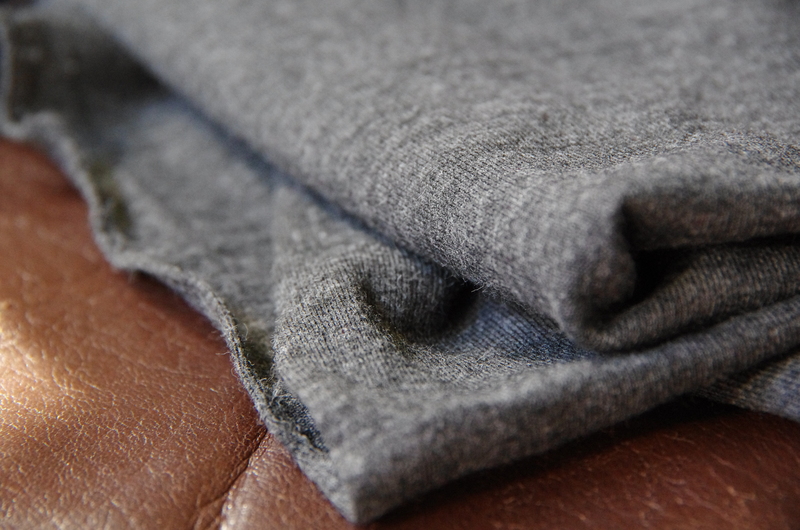 It is deliciously soft and thinner than most t-shirt style knits. 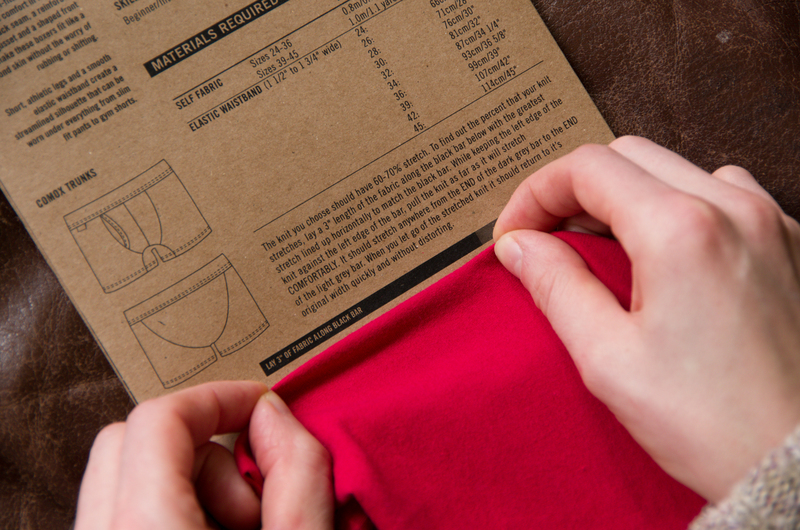 It is strong though and has just enough spandex content that it works perfectly for the trunks: While it might be difficult to find a bamboo blend knit in your local fabric store, most fabric stores have at least one or two bolts of t-shirt style knits. These are medium weight knits that usually have a high cotton content. 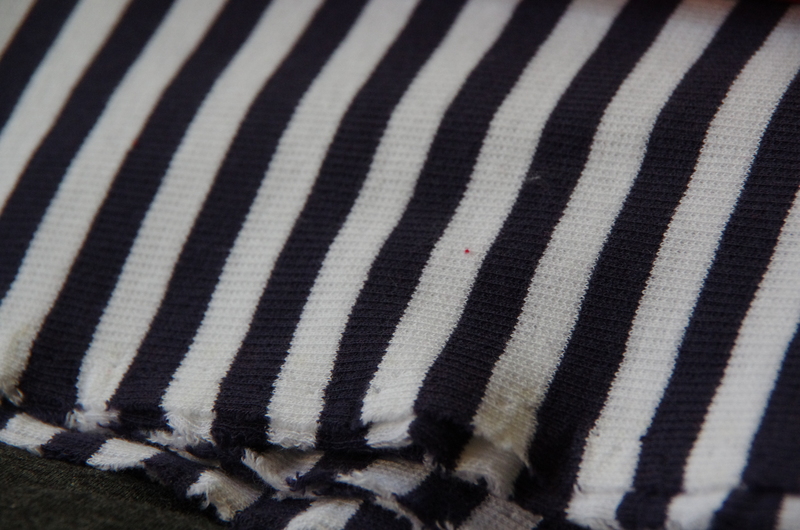 Here is an example of this (a medium weight striped t-shirt knit comprised of 95% cotton and 5% spandex): A more stable (and thus easier to sew!) form of the t-shirt knit is also commonly found in fabric stores. The one I found is this red "Sport n Play" actionwear T-knit Jersey which is comprised of 90% cotton and 10% spandex. This is a great choice for people who are new to knits because it has a lot of stretch (so your tight fitting garment will stay tight fitting) but is also thick enough and tightly knit enough that it won't warp and become misshapen while you sew: Lastly, as you saw in the photos of the prize pack that I showed the other day, I picked up a novelty Canadian maple leaf knit which was simply labelled "mixed fibres." It doesn't have as much elasticity as the other fabrics but has still worked well for the trunks: Since the trunks only need a small piece of fabric and a short amount of time to sew, if you are in doubt about your fabric choice, why not try out a few types so that you will become more confident with sewing knits in the future (armed with your Comox Trunks sewing knowledge, you'll be eager to start sewing all sorts of comfy knit sweaters and dresses!!!) To figure out if your prospective fabric has enough elasticity, use the handy knit guide in the instruction booklet (and also on the back of the envelope if you purchased the tissue version of the pattern). To use this guide while standing beside the bolt of fabric in the store, lay down the guide on a table (or have someone hold it for you) and unroll a length of fabric to work with. Since the Comox Trunks require a material that stretches in all directions (in other words, a fabric with 4-way stretch), you can test either the length or width of the fabric first. Just remember to test the other direction after! Hold a 3" length of fabric up to the black bar and mark and keep the left hand (which is pinching the fabric) stable and still at the edge of the bar. Stretch your right hand and the fabric to the right until the fabric has stretched as far as it easily wants to go (don't use all your strength, you will be able to tell how far it naturally wants to stretch). If your right hand and the pinched end of the 3" chunk of fabric are now within the lightest grey section of the bar, the fabric you have chosen has enough stretch to be made into Comox Trunks! One last thing you want to check is how quickly and completely it 'bounces' back to its original position. 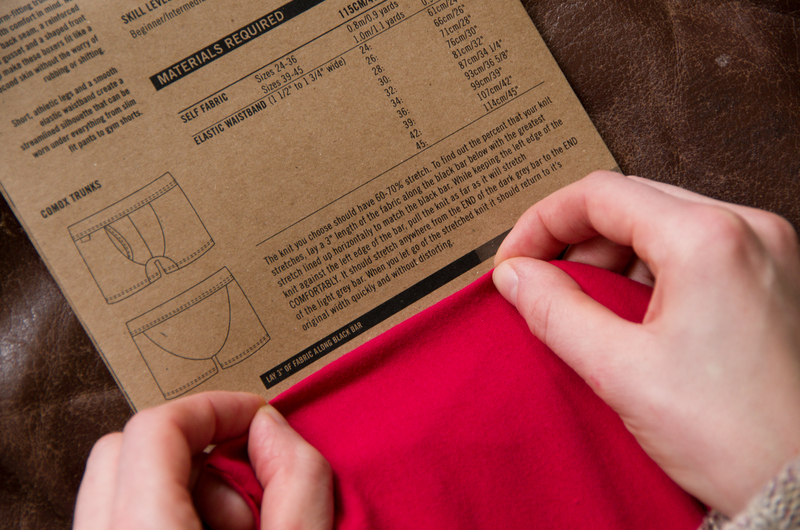 If your fabric looks stretched out or warped when you release your right hand then it does not have enough spandex content and resiliency to maintain its shape once made into the trunks. 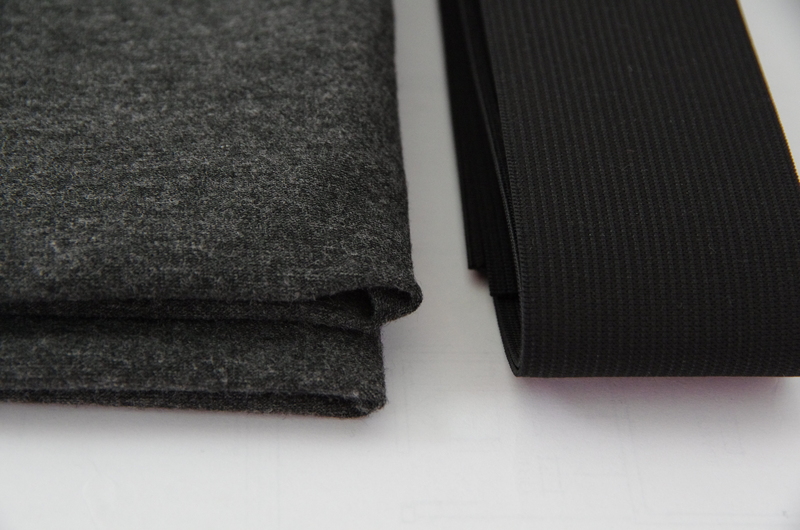 Now that we've found a suitable fabric, its time to move on to choosing an elastic! The elastic I am using (the same elastic that is included in the kits) is firm without being scratchy. It is not soft on one side as some ready-to-wear underwear elastics are (both sides are the same texture on this elastic) but it is very strong and will likely survive many washes before it begins to ripple. If you are sewing these trunks for someone with extremely sensitive skin we will be covering how to create a soft fabric casing for the elastic later on in the sew-along! While the pattern calls for 2" elastic, it is perfectly acceptable to choose something wider or narrower. I like the look of the 2" band and Matt thinks that this width produces the comfiest results (narrower elastics can sometimes create the feeling of a little more pressure against the skin). It is very common to see trunks with 1" to 1/2" elastic bands so go ahead and save a bit of money by choosing a narrower elastic if you desire! 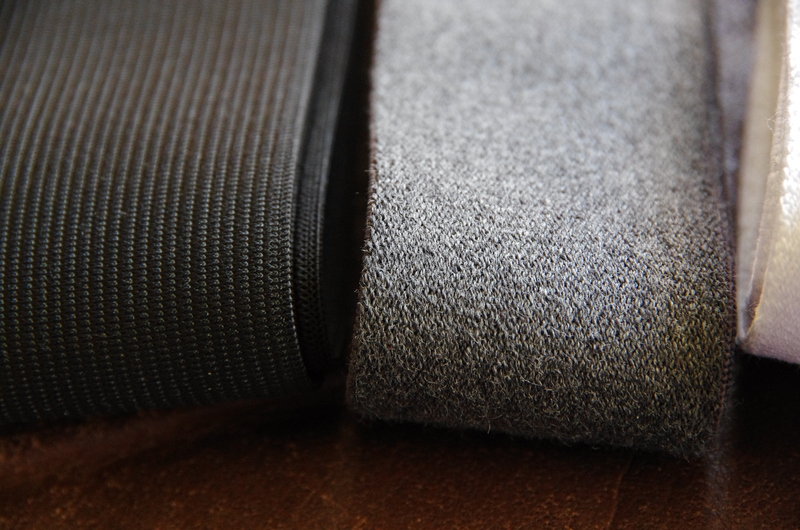 The plush elastic that I picked for the sew-along prize pack is 1 1/2" wide and is quite thick. It is very soft on both sides. Here you can see how the two types compare: While you're at the fabric store, don't forget to pick up a needle suitable for sewing knits. You can sew the entire project using a ball point needle or stretch needle. If you like using a twin needle, you can buy one of those for the hem and for attaching the elastic waistband. 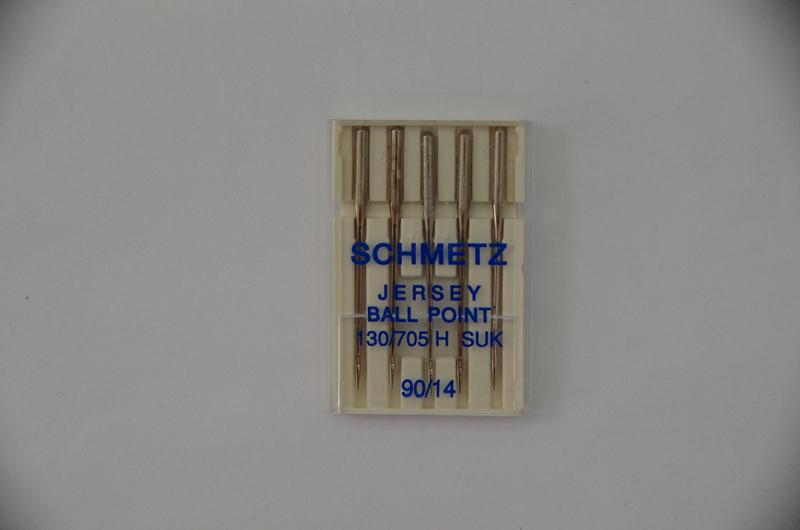 These are the ball point needles that I use: Have any questions about what supplies you will need? 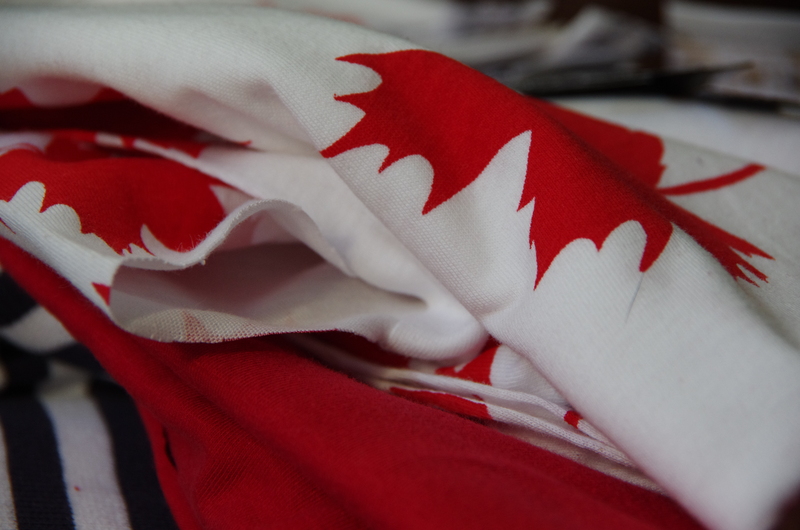 If you are hesitating over a fabric or elastic choice, I would love to give you my opinion - just leave a comment or send us an email (info@threadtheory.ca)! Join us again in two days to pick a pattern size and to contemplate any customizations you might like to do! I think I am going to give these trunks a try despite my boyfriend not being too enthusiastic about the idea. I’ll just make some for my dad or brother. ;-) How much stretch should the elastic for the waistband have? oh emmely beat me on it. ;) Zwi could indeed mean that it is a twin-needle (“Zwillingsnadel”). If it isn’t black, you could always cover it with self fabric to make it more manly :) We’ll be going over that in a future post. Good luck with your trunks! I bet your hubby will be excited once he realizes how comfy they are.